Yay for December! I've been a little jealous of all the holiday baking, blog posts and talk of Christmas decorations going up but I have one rule: NOTHING in November! Ok, sure, I made those mince pie croissants but otherwise no, it's too early. Well, it's game on now :-) After this blog post I'm getting out the boxes of decorations and going for it. Have I mentioned I love Christmas? These turned out beautifully. Cranberry and white chocolate is such a nice combination, it's one of my favourites and while I have made cookies before which were nice I haven't had a hand at vegan shortbread and saw these in a recipe so thought I would have a go veganizing it. The cookie itself has a great texture, holds together really well - it doesn't even crumble apart whilst cutting it and is nice and crisp yet melts in your mouth like a shortbread should. 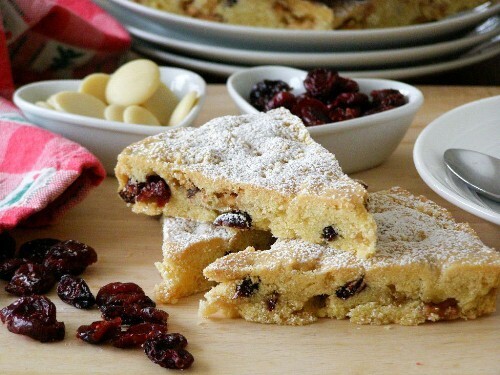 As much as I love the cranberries and white chocolate in these I will also try this recipe plain as I think it would make great 'regular' shortbread too. The flavour is so good as well but I did a little cheat here: butter flavour extract. Even though the vegan margarine I use, Vitalite, has a really buttery flavour I felt shortbread needed a little boost to get it super buttery... and yes, it is actually vegan! 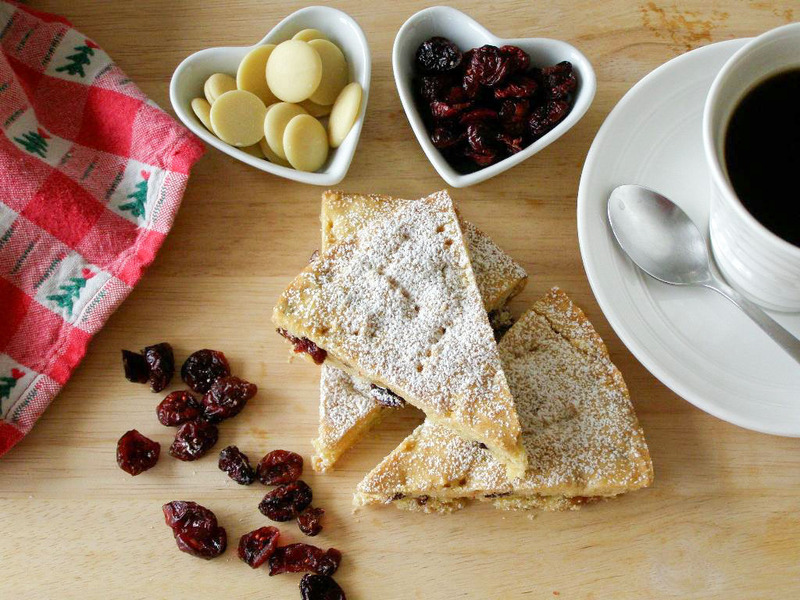 You don't want to use much of it though as too much will give your shortbread a rather artificial taste but just a touch of it does give sweet treats that are normally very buttery tasting, well, buttery tasting! Cranberry White Chocolate Shortbread: makes 8 large wedges or 12 smaller wedges. Line the bottom of a 7" round cake tin with baking paper. 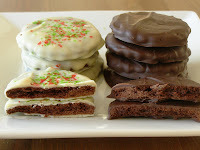 You can easily double this recipe as well and line 2 cake tins or one 9 x 13" cake tin. Preheat the oven to 150C (300F). Mix together the flour, cornstarch and salt. Set aside. In a large bowl beat the butter with the icing sugar and extracts until very creamy. 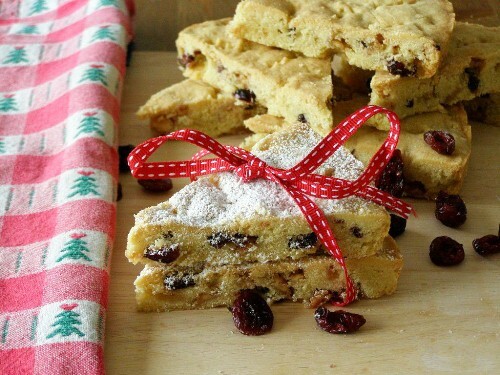 Stir in the flour until all combined then fold in the chopped cranberries and white chocolate. Spoon it into the prepared pan/s and with well floured hands press the mixture evenly into the prepared tins. Prick all over with a floured fork and bake for between 40 - 50 minutes. My first batch I did 50 minutes but it was a little overcooked, you just want the edges turning lightly golden. My second batch I did 45 and that was just right for my oven. Let cool in the tin on a wire rack for 30 minutes then remove and slice while warm. I used a serrated knife here as I found it easiest. 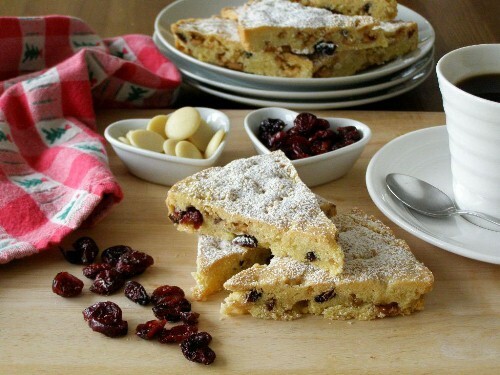 Dust with icing sugar and serve warm or let cool to warm temperature. 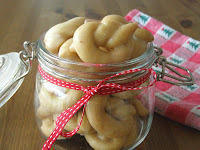 Once fully cool these also pack up really well as they don't fall apart making perfect gifts. I wrapped some up in brown baking paper and tied a ribbon around with a little hand made label. Where do you get butter flavour extract? I've never seen it. Also, what brand is the vegan white chocolate? I usually find the bought stuff isn't very good, but I haven't seen buttons around much. These look lovely. I've never heard of butter extract before. What brand did you use and where did you get it? I can find a few brands online but they are ship from America (I'm in England). For the butter extract, I should have specified here that I have used Wilton brand butter extract. Katie at "Chocolate Covered Katie" contacted the company and got confirmation that it is vegan. So I can't confirm that other brands are vegan. I picked mine up in a local kitchen/sugarcraft shop here in Cork. Not sure about England as I never saw the stuff when I lived there but I do know that Hobbycraft stock Wilton extracts so if you can, maybe try them? Or maybe online via sugarcraft websites in England? Thanks! I'll have to see if Humdinger will be available in Australia (when ever i get back there). Yay for December and yay for shortbread! Seriously, that looks so wonderful!